Preveli, located on the south coast of Crete, competes with the beach Vai in the north for the title of the most exotic beach on Crete. 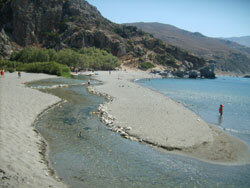 A freshwater river flows through Preveli, ending in the Libyan Sea. The freshwater feeds the rare species of palm trees growing here, giving the beach the ambiance of a tropical beach, or even an oasis. Even better, this little paradise is a clean paradise, and you can swim either in the Libyan Sea or the river (about 30cm – 3m deep). Since the river water comes directly from the mountains, the water is cool and refreshing in the blazing heat of summer. There’s a simple bar with soft drinks, snacks and toilets which is open most days in summer. If you like pedal boats and canoes, head to the mouth of the river, where you can rent (around €5 for 30 minutes in 2013). If you just want to indulge in the atmosphere, deck chairs and umbrellas can be yours for about €3 per person (2018 price). 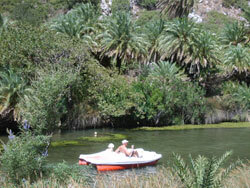 It’s worth walking up the river for a few hundred metres to get a feel for the area, and enjoy the exotic palm trees nestling in the dramatic Cretan landscape. From the 60s through to the 80s Preveli was one of the hippy centres of Crete, where hundreds of people found an alternative lifestyle, sleeping on the beach and among the palm trees. However, in the 80s the local authorities came to realise the commercial value of the beach (rather than any environmental concerns), and expelled the hippies from the beach to make way for more conventional beachgoers. Staying overnight at the beach is now strictly prohibited, though some long-term residents of the beach now camp a few hundred metres upriver, some even building little wooden huts. The bus connections from Plakias and Rethymno are good in summer, going 4 times daily (a one-way ticket cost around €2 from Plakias, €4.50 from Rethymno in 2019). 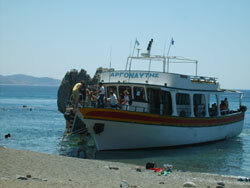 If you come by bus from Rethymno you have to change to a mini-bus in Plakias. 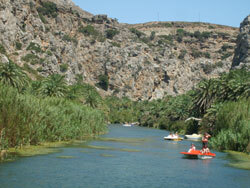 Timetable Plakias - Damnoni Beach - Lefkogia - Preveli: 10am, 11am, 12am, 6pm. The buses every day of the week. They stop up near the stairs to Preveli-Beach and at the monastery of Preveli. By boat, car, taxi and hiking: You can also reach Preveli by boat - though only in the season - from Plakias and Agia Galini (in 2019 a one-way ticket will cost about €8, return €15). The ships leave in the morning and return late in the afternoon or early in the evening, and they drop you straight on the beach, which is an advantage for those who don’t enjoy too much physical exertion – if you take the bus, there’s 30 minutes worth of stairs to get down the cliffs. 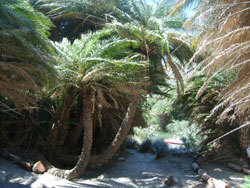 However, this path also provides stunning views of the beach and the surrounding area. If you take a car, you’ll also have to walk down these steps (parking €1.50). A taxi from Plakias wll cost you little more than 10 Euro. Walking on the road or through the mountains takes 2 to 3 hours one way. You can also hike from the monastery tp the beach in about 45 minutes. Ammoudi lies almost next to Preveli, and the two bays are connected with by a path (10 minutes). 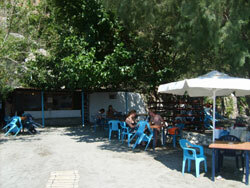 In Ammoudi and around there are 2 good tavernas and a nice beach (far quieter in summer). You can get there driving on a non-signposted road. If you want to take this road, ask at the good restaurant next to the old Venetian bridge which you’ll see as you drive the main road to Preveli.